Budgeting. It’s the cornerstone of creating a sustainable meeting or event. It can help determine the scope of the event, return on investment (ROI) and more. Here is what I wish someone had told me about the budgeting process as an emerging meetings professional. What Should I Consider When Budgeting? Estimate your budget based on the current market (i.e. New York City versus Richmond, Virginia, versus Laguna Niguel). This is best for events that are open to many locations and can help narrow the focus of where to host the meeting or event. Estimate your budget based on request for proposal (RFP) response costs. This is best for events that need to be held in a specific location, allowing you to budget using real quotes. Estimate your budget based on year-over-year history. This is best for recurring meetings or events. 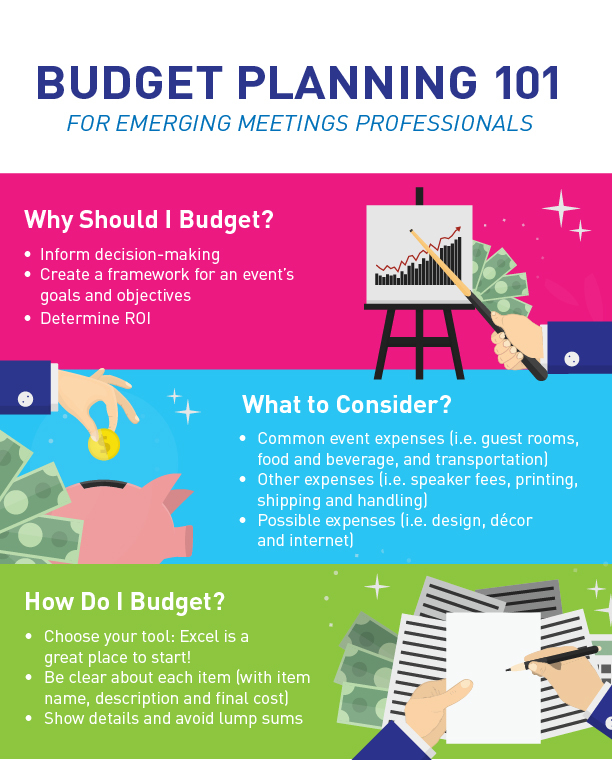 While these are just a few tips for budgeting, I hope that emerging meetings professionals may find this information helpful. In meetings management, with experience comes confidence, yet something new to learn is always just around the corner.